It's easy to fall into a rut when you pack a lunch every day. Here are some of our very favorite foods for guilt-free bagged lunches! Boar's Head Deli Meat - Any extra-lean deli meat (97 - 98% fat-free) is a smart choice, but the options from Boar's Head are our hands-down favorites! In addition to flavor-packed offerings like the Chipotle Chicken Breast -- only 60 calories and 1g fat for a 2-oz. serving (PointsPlus® value 2*) -- BH serves up Lower Sodium and No Salt Added options. Hooray! 100-Calorie Flat Sandwich Rolls - Basic bread has nothing on these sandwich staples. Many brands make 'em, but we tend to go for the kinds by Arnold/Brownberry/Oroweat, which come in a slew of varieties. Honey Wheat? Yup. Flax & Fiber? Absolutely. Arnold even makes a Seedless Rye! Another top-notch sandwich find? Flatout Hungry Girl Foldit Flatbreads (at Walmart and Walgreens)!!! StarKist Single Serve Tuna Pouches - The great thing about these pouches? VERSATILITY. You want a salad? Empty a packet of Tuna Creations over your greens. You want a sandwich? Scoop the Ready-To-Eat Tuna Salad onto one of the aforementioned rolls or Foldits. Running out the door with no time to assemble anything? Grab any packet and a fork! Our flavor of choice is most definitely the Sweet & Spicy Tuna Creations -- just 90 calories and 0.5g fat (PointsPlus® value 2*). The Laughing Cow Cheeses - The Light wedges are great spread on sandwiches, fruit slices, cut veggies... You name it! 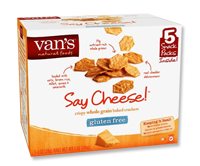 And only 35 calories and 1.5g fat per creamy wedge (PointsPlus® value 1*). Plus, Mini Babybel makes a heck of a snack-tastic lunch addition. And no need to limit yourself to Mini Babybel Light. We love all eight varieties. 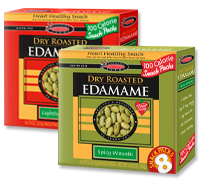 Each perfectly portioned piece has 50 - 80 calories and 3 - 6g fat (PointsPlus® value 1 - 2*). Instant Miso Soup - All you need is a mug and hot water, and you're on your way to SOUP TOWN. We have the hots (tee-hee!) for the worth-ordering-online Miko soup packs and the easy-to-find miso packets from Mishima. Each of these has 25 - 35 calories and 1g fat (PointsPlus® value 1*). Click here for soupy all-stars! HG's Official At-Work Survival Guide! Click here for many more finds, plus DOs and DON'Ts and tips 'n tricks! Three New Picks for Lunchtime Eats! Breaking chews: We've raved about these crackers before, and now they're available in convenient single-serving bags! Total score. BTW, spreading these with a wedge of The Laughing Cow Light cheese would result in cheesy fantasticness of epic proportions. 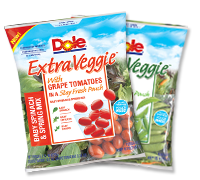 These salad blends are major time-savers! The greens come with packs of tomatoes, snap peas, or shredded garden veggies. And though the serving size above is for about a third of the bag, we'd probably eat the whole bag's worth. Still guilt-free! Pssst... A stash of Wonderful Almond Accents comes in handy for topping off a salad! Check out all that fiber and protein! In Lightly Salted and Spicy Wasabi, these crunchy things are a serious find. And like the cracker packs on this list, the portion-control aspect is a major asset. Click to find, or buy online. Grab 'n go! Snack Attack! Need some additional snacky supplementation? Click here and here for emergency snack picks, a.k.a. on-the-go options! Got a fridge at work? 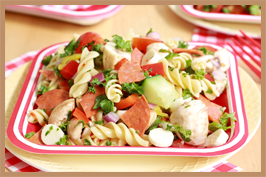 Grilled 'n Chilled Sandwich and MediterraneYUM Pasta Salad - Two more recipes developed specifically for take-along lunches! 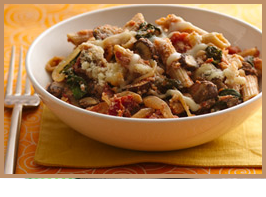 Takes-the-Cake Ziti Bake - Last night's baked pasta makes a great lunch of leftovers. Make a batch! EZ as 1-2-3-Alarm Turkey Chili - Chili tastes even better the day after you make it. Make this slow-cooker recipe on a Sunday, and Monday's lunch will rock your world! Taco-rific Spaghetti Squash Bake - This no-noodle dish is so good, we could eat it for days and not get tired of it! The Hungry Girl Lunch Planner! Want even MORE bagged-lunch ideas? Flip through the pages of this month's Redbook for an awesome HG feature! It's packed with mix-n-match options for guilt-free midday meals. Click here for the online version! Save your pals from boring bagged lunches -- click "Send to a Friend" now! Don't be scared just because it's Friday the 13th! Here are a couple of good-luck recipes from a few years back -- we still love 'em.